View north from Cima Pigna acorss the Cuneese plain. 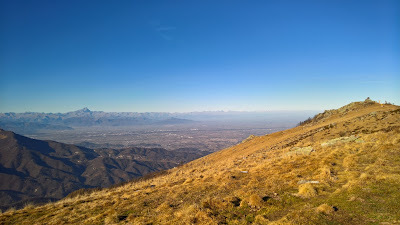 Left: View toward Monte Viso from Cima Pigna. 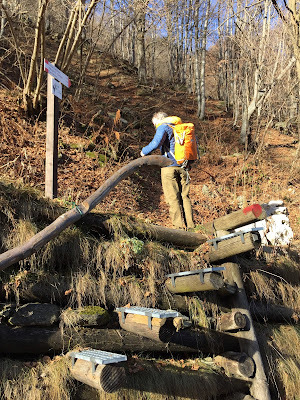 Right: Trail route from Rastello to Cima Pigna, we went in a clockwise direction. 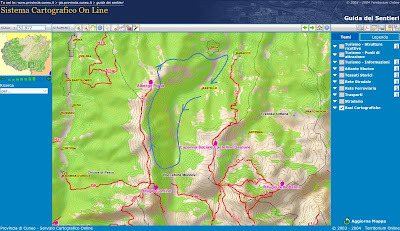 The other red line is previous day hike in Valle Pesio. Duration: About 6 hours, with a little rest time near Rifugio S. Comino. 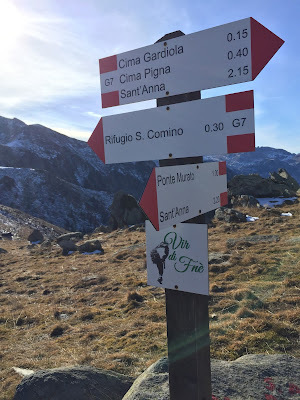 Elevation: Total elevation gain 5,265 feet (1,605 m), started at 2,485 feet (757 m) @ Rastello, max elevation 6,154 feet (1,876 m) @ Cima Pigna. We were uncertain at the start of this hike where we were going and where we'd end up because we weren't certain of what the roads and trails would be like. 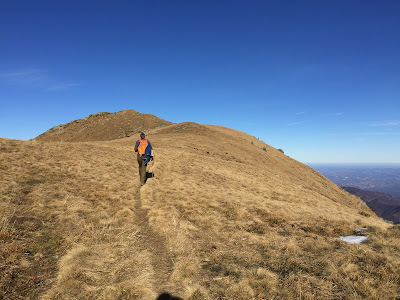 Heck, we hadn’t even planned on doing any hiking while in Piemonte visiting family, but here we are with a free day and nice weather. 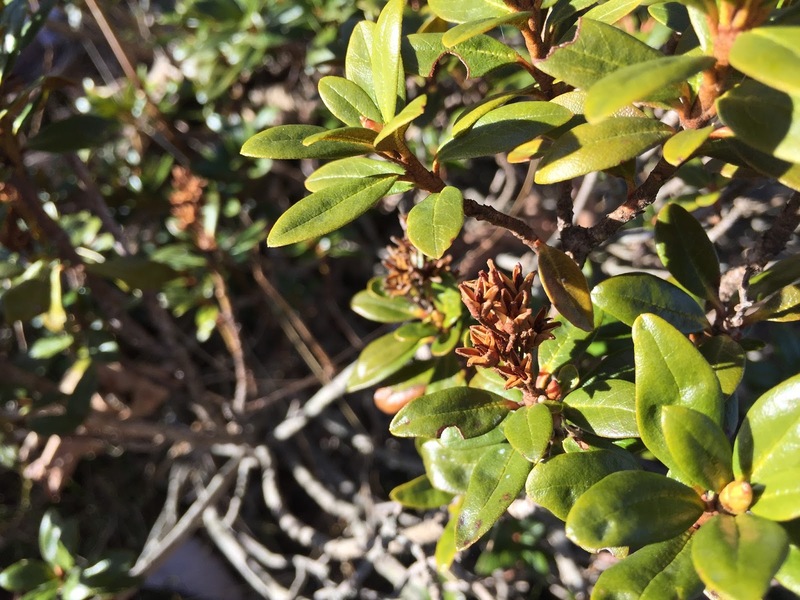 It's supposed to be winter in Piemonte, but there has been very little snow with warmer than average temperatures. 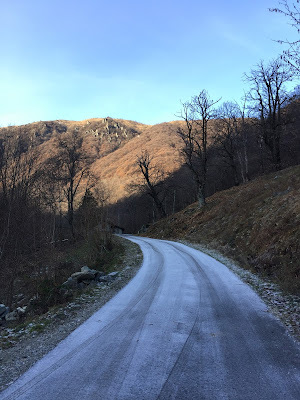 We parked in Rastello because we didn’think our rental car could make it past some ice we encountered on the road up to Rifugio Havis de Giorgio Mondovì. So we walked from Rastello up the road to Ponte Murate where we found a steep bit of trail to take us to G7. 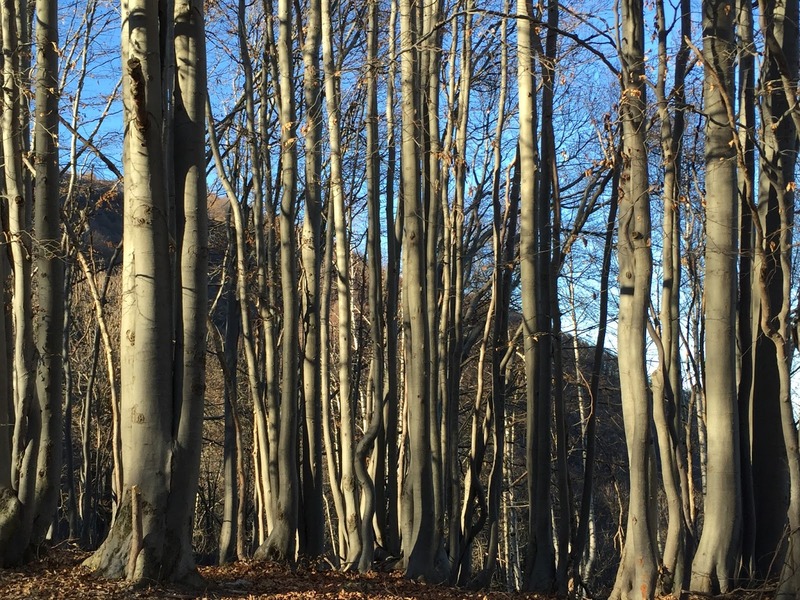 Once on G7 we headed north to Cima Pigna and then the rest was a finding our way back to Prea via country lanes and roads. 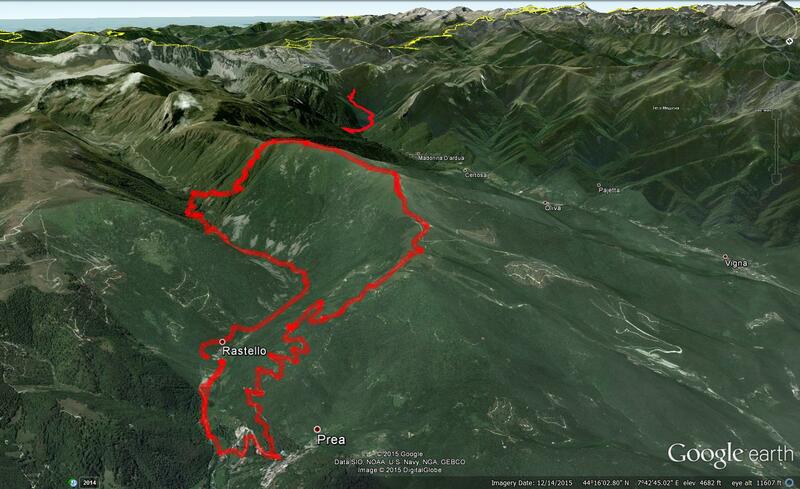 From Prea, we walked across the small valley back to Rastello. 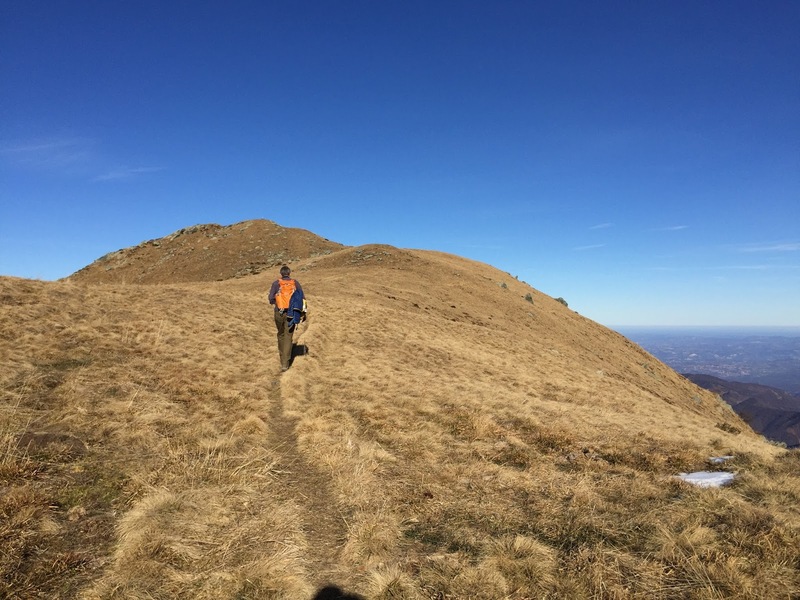 Most hikers would park in Prea and head southwest to reach the summit of Pigna, as shown here. Not us...everything in reverse. Walking on the ridge heading toward the plain, you walk between the Valle Pesio on the left and the Valle Ellero on the rise. Both valleys give rise to rivers of the same name, Fiume Pesio and Fiume Ellero. Both rivers eventually empty into the Tanaro, which in turn empties into the mighty Po River. 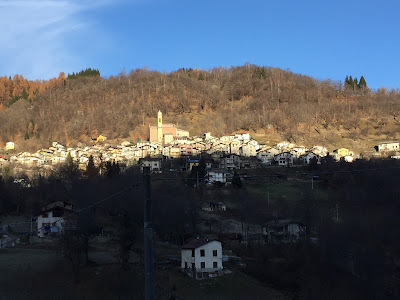 The area around Cuneo is all about the rivers and the valleys that originate in them. For example, see Alpi Cuneesi for a list of valleys. 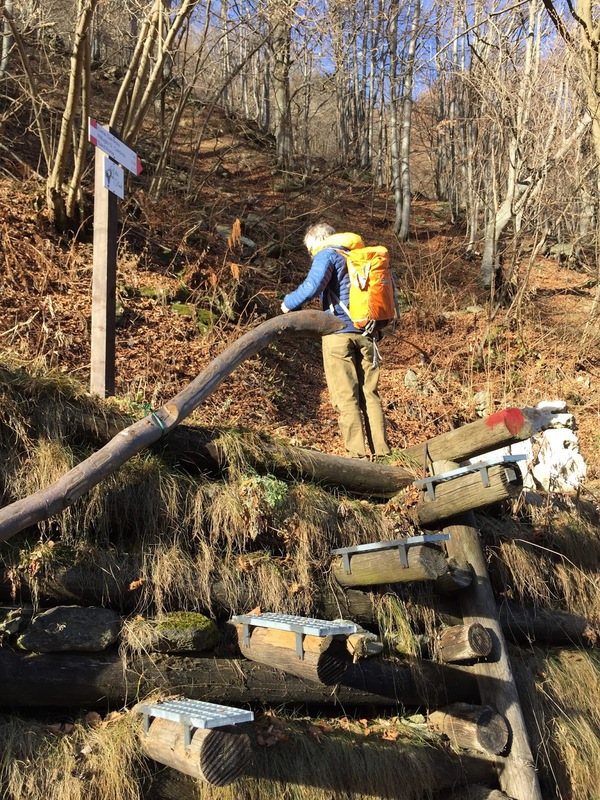 The hike described here is just outside the Parco Marguareis eastern border. You can see trails for this area from this Provincia di Cuneo mapping application. Drill in to the area of interest. 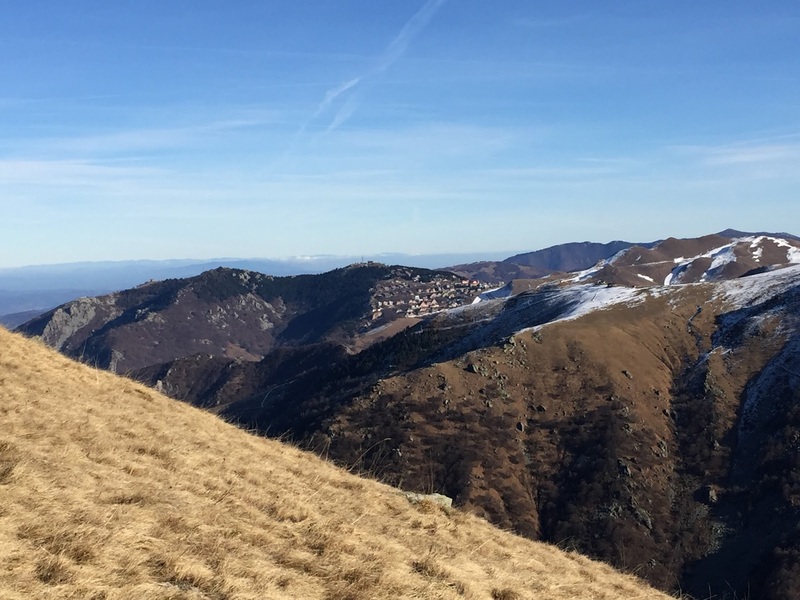 This hike is at the edge of what is also called the Pian Marchisio. 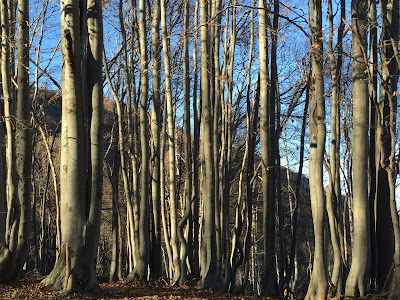 For more serious hikes for better weather, see Cuneo 360 Itinerari. You can download detailed maps from the site for Piemonte Regional geographic data. This article describes the origin of the villages of Rastello as coming from words meaning fence. Left: Road leaving Rastello and heading to Rifugio Mondovì. Center: Picking up the trail at Ponte Murate. 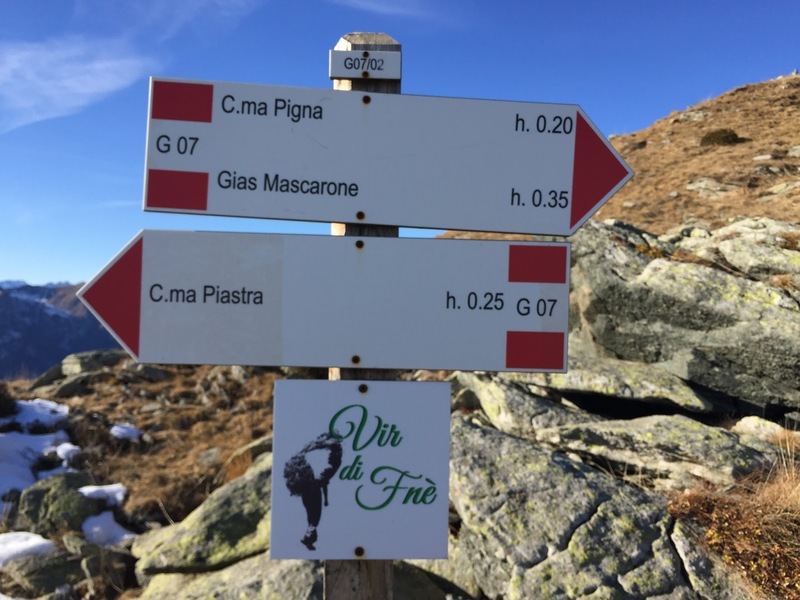 Right: Signage for G7 trail pointing to Rifugio S. Comino and Cima Pigna. Left: G7 trail signage showing time to destination. 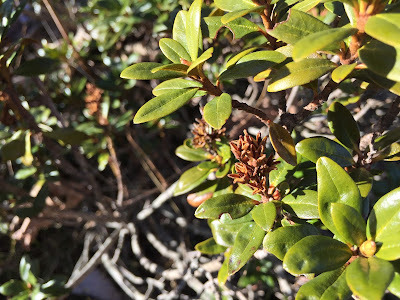 Right: A shrub common edge of high meadow with 5 seed capsules, probably Ericaceae. Left: Heading up the spine of the hill toward Cima Pigna. Right View toward Artesina ski resort. 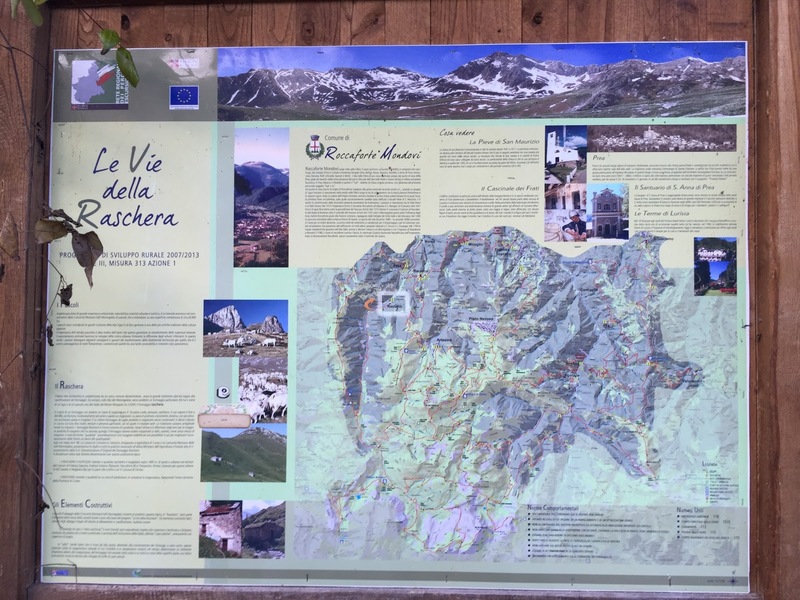 Left: Le Vie della Raschera map, Comune di Roccaforte Mondovìi. 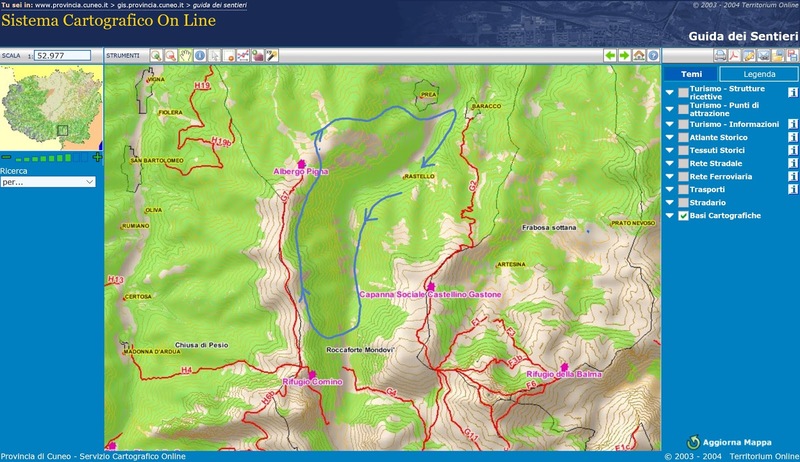 Right: Hike route (in blue) shown on a map generated from the Provincia di Cuneo Sentieri Alpini mapping application. 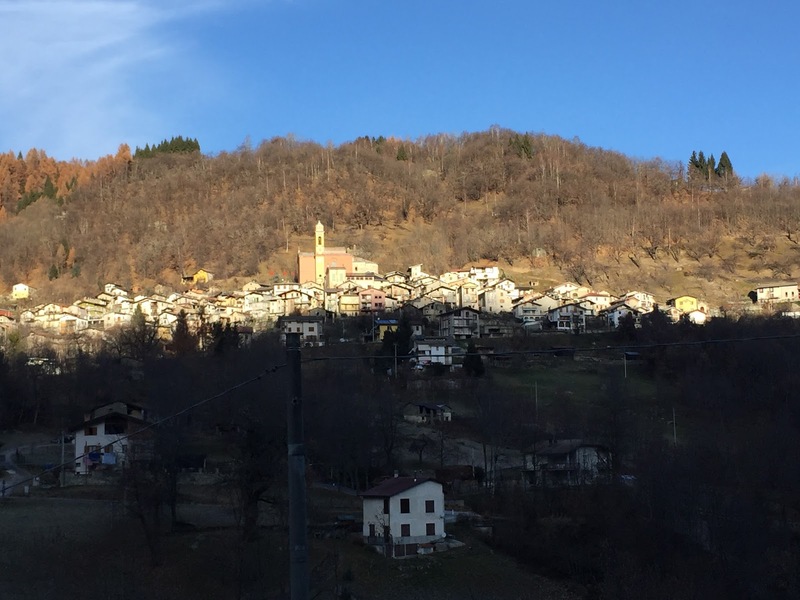 The village of Prea in the morning light.